This is my favorite recipe from a muffin book (Japanese), Itsudemo Muffin - Muffins & Quick Breads - by Asa Shirokawa. The author is a Japanese woman who had spent several years in the U.S. She wrote that she was inspired by the muffins served at a cafe in NYC and came up with this quick bread recipe after trials and errors. The recipe calls for absolutely no butter or salad oil. 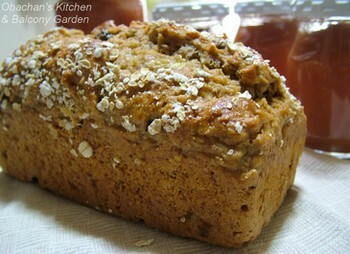 Instead, oatmeal (cooked), applesauce, banana and plain yogurt are used to make this quick bread pleasantly moist. This time, I omitted cooked apple chunks, and added a little almond powder to the dry ingredients. What I forgot to do, though, was adding a pinch of salt. It is not mentioned in the recipe but I thought a little salt would make this bread taste even better. Oh well, next time. The window may not open when you click on the "email me" link on the sidebar. Right-click on the link and copy-paste my email address, please. Thanks. The bread looks good indeed! Any chance on posting the recipe for the bread Obachan? er...perhaps impossible due to copyright issue? very nice looking bread and sandwich! Ugh...I can't access your email :[. Is it because I used Firefox so the link doesn't work? It doesn't work on my browser (Firefox), either. Please right-click on the link and copy-and-paste my email address. The texture of the bread looks amazing, and such a healthy reciepe! I'll bet your open face sandwhich tated superb! 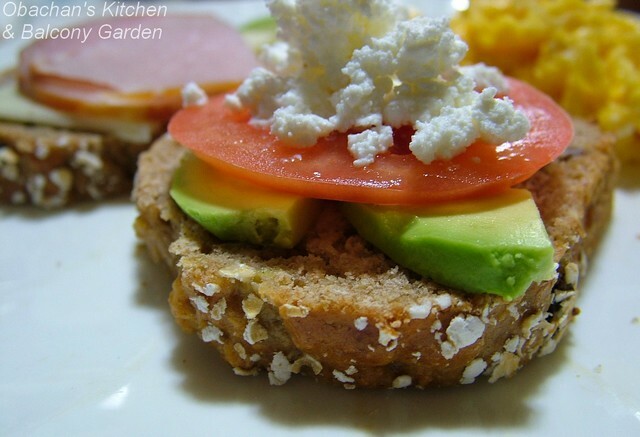 Was that Feta crumbled on top? The avacado looks perfectly ripe. Someone gave us an authentic mexican morter and pestle, so my husband has been making guacamole with flame roasted chilli pepers, everynight! We have 2 more ripe avacado's to use up. Then I hope his phase will be over!